Garage Door Materials: What Are Your Options? As you drive down the street, at first glance you may think that most people have a wooden garage door. In reality, many of these garage doors are constructed from other materials that are simply designed to look like wood. There are actually several different materials that can be used for garage doors and each of them has strengths and limitations. The best garage door material for you will depend on factors like your home decor, budget range, and specific needs. Continue reading for a breakdown of each material. One major benefit of aluminum garage doors is their resistance to rust and rot. This material is similar to steel, but can be more prone to denting depending on the type of aluminum door you choose. If you’re looking for a high-quality, low-maintenance door, aluminum is a great choice because it is both lightweight and long-lasting. Since they’re so light, they are a safe choice for a double door since it won’t weigh down the mechanics. Aluminum garage doors are also typically less expensive than traditional wooden garage doors. Many people who prefer a traditional look and feel opt for a wooden garage door. The first garage doors were made of wood and they continue to be manufactured today, but now there is much more diversity in style. 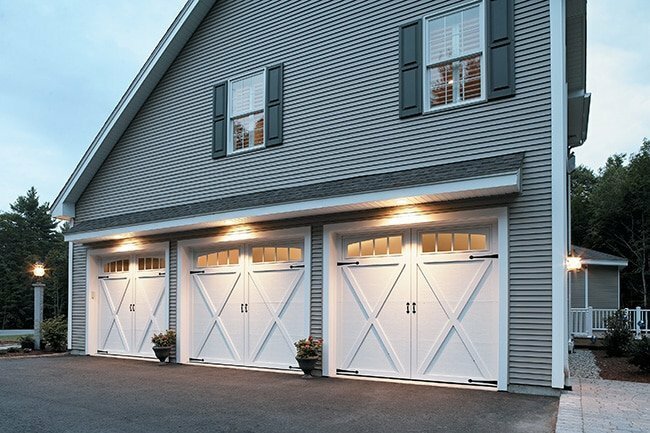 These garage doors give your house a clean, classic look, which can up your home’s curb appeal. While wood’s beautiful carved textures provide an elegance and authenticity that’s hard to match, perhaps its biggest downside is that it requires frequent maintenance and refinishing. Wooden garage doors also tend to be rather heavy. This can be an issue because if not properly balanced, the mechanical pieces of the garage door can become worn out more quickly. As one would probably guess, steel garage doors are extremely durable. They can endure harsh weather like rain and wind while also offering your home optimal security. If you like the look of wooden garage doors but don’t want the maintenance, you can install a steel garage door that’s finished to look like wood. Steel is quite cost-effective when you consider its strength and durability. While some may criticize steel for its vulnerability to rust, many home and business owners remedy this problem by adding a fiberglass overlay or a polyester topcoat. Fiberglass is a durable garage door material. This is another good alternative for people who like the look of wooden garage doors, since these doors can be produced with a wood grain texture but will be strong like steel. Its flexibility helps protect it from warping (a common concern with wooden doors), so it’s a wise choice for buildings in damp climates. Fiberglass is customizable, low-maintenance, and is available in a wide variety of colors, making it a favorable option. Still not sure what garage door material would work best for your home? The experts are Hill Country Overhead Door are standing by, ready to help answer all your questions! Give us a call or fill out our contact form today to speak to a garage door expert.